A Dental Assistant will help the Dentist with a variety of dental assistance task including taking x-rays, helping with record filing and scheduling appointments. The other major roles and responsibilities listed on the Dental Assistant Resume include the following – welcoming customers in the dental office, prepping patients for treatment, ensuring patient’s comfort, selecting and setting instruments and equipment needed for the treatment, assisting in 4-handed dentistry, undertaking lab tasks, providing oral hygiene, following post-operative treatment, scheduling appointments, collecting and recording medical and dental histories and maintaining dental equipment. 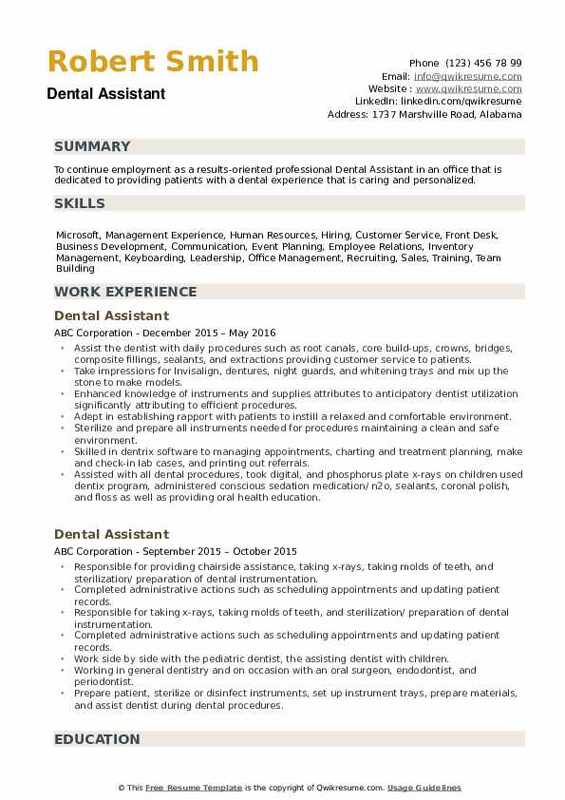 Some of the basic requirements considered essential for the job include – knowledge of dental instruments and various sterilization methods, a good understanding of health and safety regulations, the ability to perform non-surgical tasks, experience using computers for various tasks, and professional appearance. Eligible candidates should have a dental hygiene program completion certificate and also a Dental X-Ray certification. 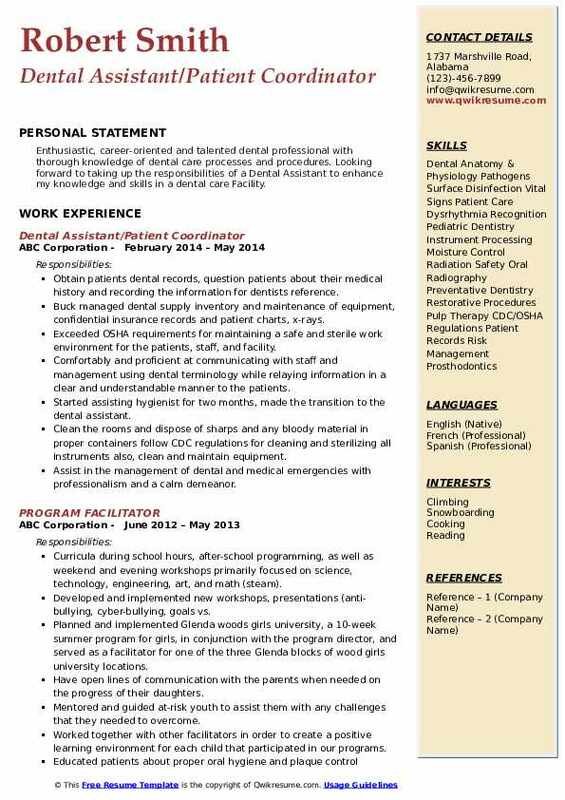 Objective : Certified Dental Assistant experienced in direct patient care, routine laboratory tasks, creating and updating patient records and general office management. Compassionate well-versed in four-handed chair side dentistry, routine restorations and intra-oral techniques. Advising patients on dental care procedures and processes making patients feel comfortable before, during and after dental treatment. Handle instruments and other materials during procedures, taking x-rays and impressions of patients' teeth. Designed a dental report card that explained patients' dental health status and treatment plans. Objective : To secure a responsible and challenging position within a progressive organization where I can utilize my knowledge and experience towards fulfilling the needs of that organization and enhancing my own experience in the field. Scheduled and walk-in customers for an initial interview and to establish patient records, identifying dental insurance and coverage benefits, and finally escorting the patient to scheduled operatory. Ensure operatory was neat and orderly, that all examination instruments were present, and that all medical supplies, materials, and medicines were available for the procedure to be performed. Produced through manual processes using developer and fixer chemicals. 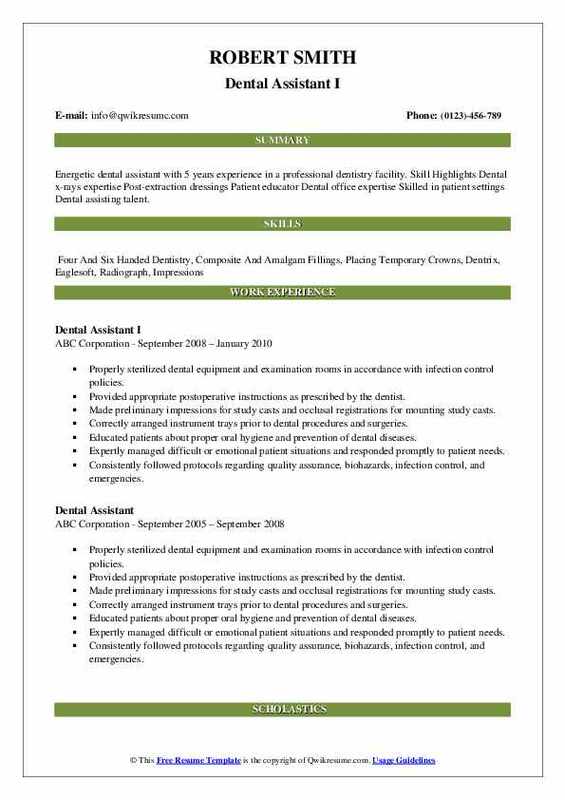 Assisted attending dentist in the patient review, dentition examinations, diagnosis, provided instrumentation as requested, and prepared material mixes. Performed occluding bite impressions with alginate, as well as, bite registration impressions, and assisted the doctor in performing the final impressions with heavy/light body materials. Completed reviewed treatment taken with the patient, identified associated costs, secured payment, and arranged any follow-up appointments. Cleaned, disinfected, organized, and restocked patient operatory in accordance with OSHA standards and finalized the labeling and disposition of outgoing lab cases pertinent to the day's appointments. Logged and annotated patient dental records, associated lab case items, and packaged any other materials that were to be sent for further laboratory processing. 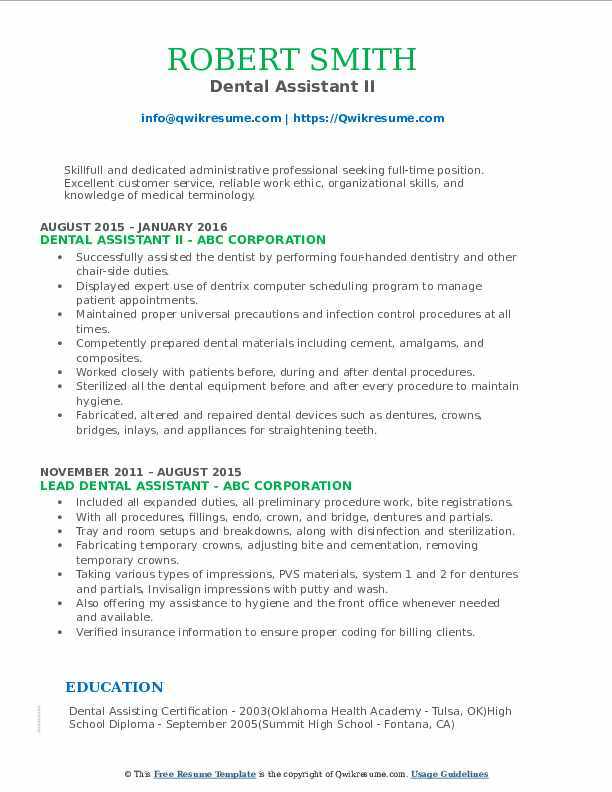 Objective : Energetic dental assistant with 5 years experience in a professional dentistry facility. Skill Highlights Dental x-rays expertise Post-extraction dressings Patient educator Dental office expertise Skilled in patient settings Dental assisting talent. Provided appropriate postoperative instructions as prescribed by the dentist. Made preliminary impressions for study casts and occlusal registrations for mounting study casts. Correctly arranged instrument trays prior to dental procedures and surgeries. Educated patients about proper oral hygiene and prevention of dental diseases. Expertly managed difficult or emotional patient situations and responded promptly to patient needs. Consistently followed protocols regarding quality assurance, biohazards, infection control, and emergencies. Consistently ensured the functioning and sterilization of equipment being used. Assisted complex surgical extractions of partially and fully impacted teeth that required a surgical handpiece for sectioning of teeth. 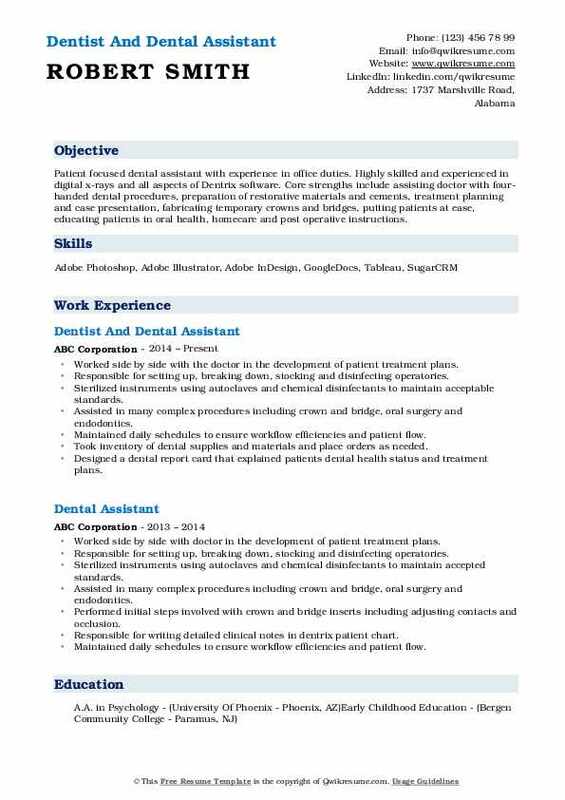 Headline : Patient focused dental assistant with experience in office duties. Highly skilled and experienced in digital x-rays and all aspects of Dentrix software. Core strengths include assisting doctor with four-handed dental procedures, preparation of restorative materials and cements, treatment planning and case presentation, fabricating temporary crowns and bridges, putting patients at ease, educating patients in oral health, homecare and post operative instructions. Worked side by side with the doctor in the development of patient treatment plans. Responsible for setting up, breaking down, stocking and disinfecting operatories. Sterilized instruments using autoclaves and chemical disinfectants to maintain acceptable standards. Assisted in many complex procedures including crown and bridge, oral surgery and endodontics. Maintained daily schedules to ensure workflow efficiencies and patient flow. Took inventory of dental supplies and materials and place orders as needed. Designed a dental report card that explained patients dental health status and treatment plans. Expose intra-oral dental diagnostic x-rays in accordance with all guidelines to ensure patient safety provide personal oral care instructions. Take and record patient medical and dental histories, record treatment information in patient records with 100% accuracy. Headline : Skillfull and dedicated administrative professional seeking full-time position. Excellent customer service, reliable work ethic, organizational skills, and knowledge of medical terminology. Competently prepared dental materials including cement, amalgams, and composites. Sterilized all the dental equipment before and after every procedure to maintain hygiene. Fabricated, altered and repaired dental devices such as dentures, crowns, bridges, inlays, and appliances for straightening teeth. Assist and performs four handed dentistry in support of restorative, prosthodontic, endodontic and orthodontic care. Objective : Passionate and committed to demonstrating critical thinking, , and decision making skills using logic and reasoning to identify strengths & weaknesses, consider the relative costs and benefits of potential actions and displaying knowledge of principles and methods for the pharmaceutical field and customer service. Shaped and soldered wire and metal frames and bands for dental products, using soldering irons and hand tools. Prepared patient for examination and treatment sterilized instruments and set up instrument trays. Provide postoperative instructions prescribed by dentist and instruct patients in oral hygiene and plaque control programs. Objective : Enthusiastic, career-oriented and talented dental professional with thorough knowledge of dental care processes and procedures. Looking forward to taking up the responsibilities of a Dental Assistant to enhance my knowledge and skills in a dental care Facility. Obtain patients dental records, question patients about their medical history and recording the information for dentist's reference. Buck managed dental supply inventory and maintenance of equipment, confidential insurance records and patient charts, x-rays. Exceeded OSHA requirements for maintaining a safe and sterile work environment for the patients, staff, and facility. 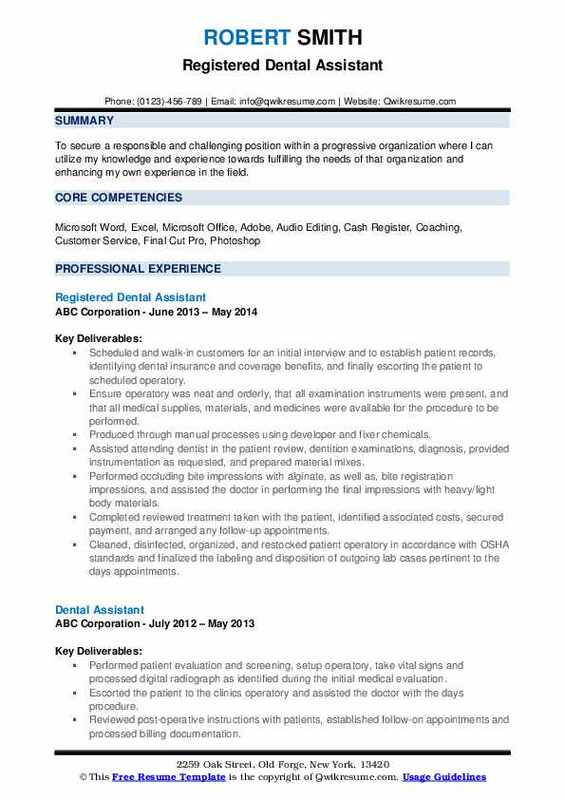 Comfortably and proficient at communicating with staff and management using dental terminology while relaying information in a clear and understandable manner to the patients. 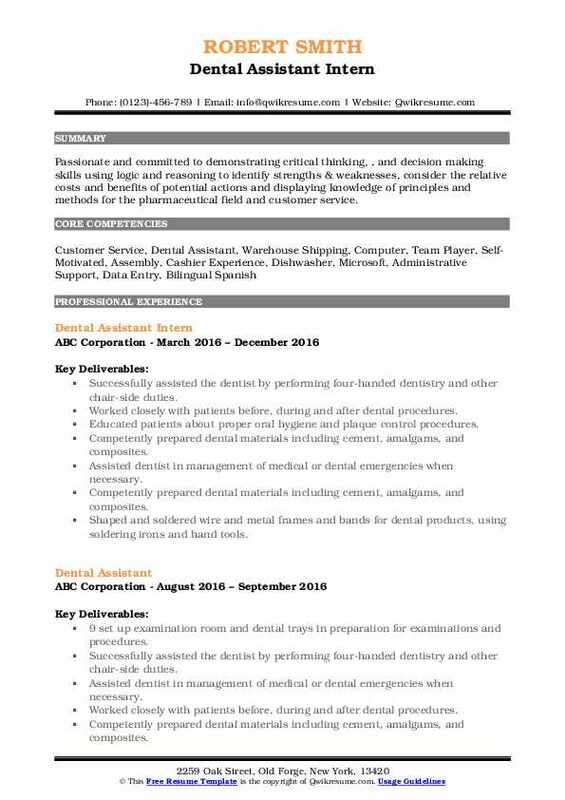 Started assisting hygienist for two months, made the transition to the dental assistant. Clean the rooms and dispose of sharps and any bloody material in proper containers follow CDC regulations for cleaning and sterilizing all instruments also, clean and maintain equipment. Assist in the management of dental and medical emergencies with professionalism and a calm demeanor. Objective : To continue employment as a results-oriented professional Dental Assistant in an office that is dedicated to providing patients with a dental experience that is caring and personalized. Assist the dentist with daily procedures such as root canals, core build-ups, crowns, bridges, composite fillings, sealants, and extractions providing customer service to patients. Take impressions for Invisalign, dentures, night guards, and whitening trays and mix up the stone to make models. Enhanced knowledge of instruments and supplies attributes to anticipatory dentist utilization significantly attributing to efficient procedures. Adept in establishing rapport with patients to instill a relaxed and comfortable environment. Sterilize and prepare all instruments needed for procedures maintaining a clean and safe environment. 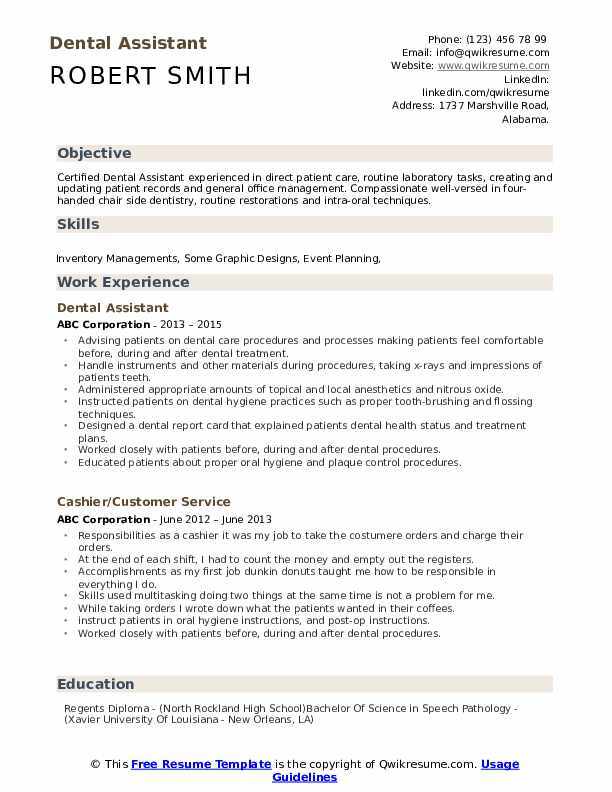 Skilled in dentrix software to managing appointments, charting and treatment planning, make and check-in lab cases, and printing out referrals. Assisted with all dental procedures, took digital, and phosphorus plate x-rays on children used dentix program, administered conscious sedation medication/ n2o, sealants, coronal polish, and floss as well as providing oral health education.